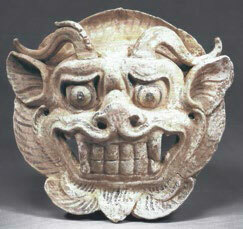 A pottery mask of a ferocious monster, the rounded face moulded in high relief with fierce features. The monster has large bulging eyes and pronounced eyebrows over a wide mouth, which he opens to reveal sharp teeth. The monster’s large nose is upturned and two antler-shaped horns protrude from the top of its head. The big ears and the mane are spread around the face. The mask has several holes for attachment. There are some traces of red and black pigments on the surface of the pottery, which further serve to emphasise the ferocious features. This device, known as pushou in Chinese, is rare in the Tang period and appears to be revived in earthenware as a deliberate archaism. In a tradition dating from at least the Han dynasty (206 BC – 220 AD), the doors of the inner burial chambers of large tombs bore the head of a monster, possibly a taotie in origin, combined with a ring in the form of a door knocker, together known as ‘pushou’. Taotie masks are the faces found on Chinese archaic bronzes and are generally referred to as ‘monster masks’. Pushou were normally made of metal, such as a gilded bronze example excavated from Chengdu city, Sichuan province in 1942, which is dated to the Great Shu kingdom (907 – 925) of the Five Dynasties and is now in the collection of the Yongling Museum in Chengdu city. 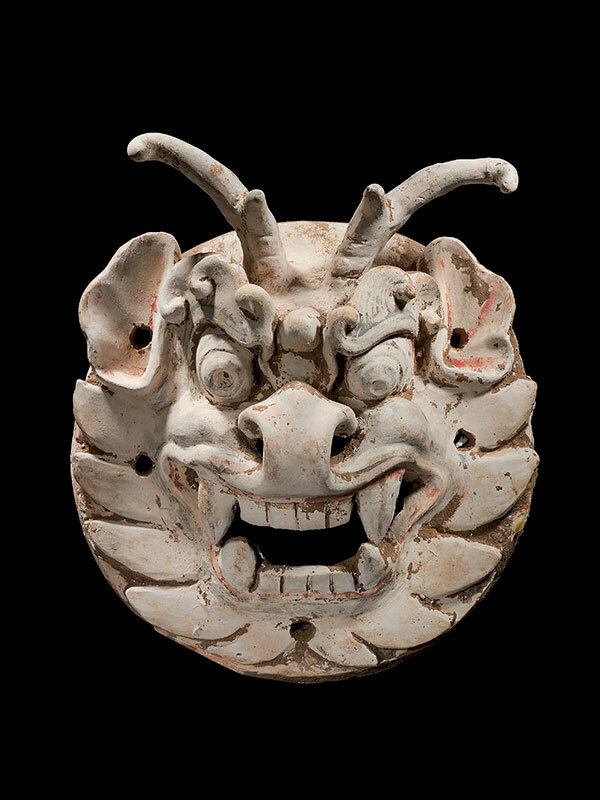 A closely comparable Tang dynasty pottery horned monster mask of similar size and also with bared teeth from the collection of Anthony M. Solomon was exhibited at Harvard in 2002 (fig. 1). A smaller green-glazed pottery horned monster biting a ring, similar in the ferocious manner and dated to the first half of the 8th century, is in the collection of the Fitzwilliam Museum, Cambridge. An example of a 7th century monster mask of square shape, which was possibly used as decoration of a Buddhist shrine, is in the collection of the British Museum.